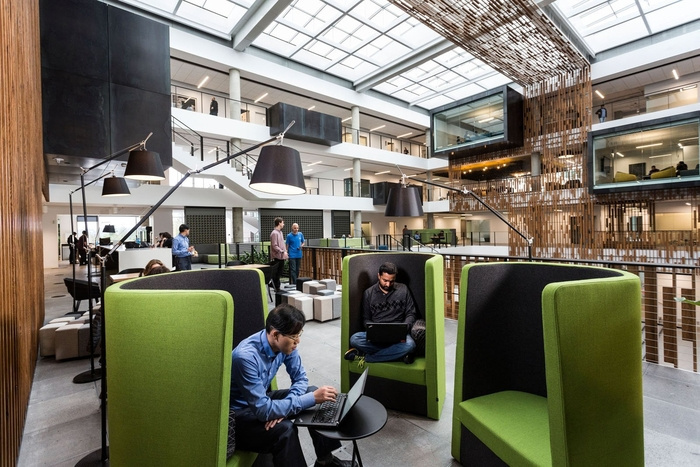 Bora Architects have designed the new offices of global tech company Microsoft located in Building 83 in Redmond, Washington. 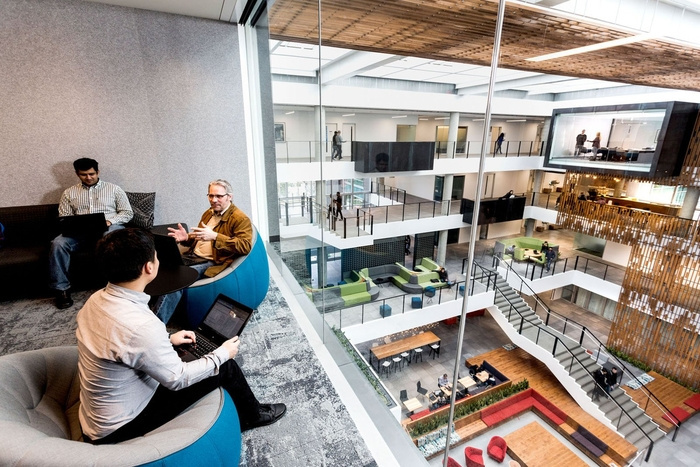 Building 83 creates a multi-sensory experience, incorporating tactile textures and ambient soundscaping to enhance employee happiness and productivity. An auditory art piece titled ‘Elements’, by Ethan Rose, plays in the vestibule. The ever-changing musical composition is interpreted by software drawing from real-time data collected by a weather station on the building roof. The Portal, an all-white structure of undulating aluminum ribs marks the transition from the lobby to a four-story atrium in the building’s core. Natural light fills this central volume, bringing together 1200 occupants from 14 work wings. An espresso bar anchors the ground floor. Above, glass conference rooms hover over the atrium rim, offering views of the activity below. The Continuum, a custom-designed wood screen made from recycled oak, traverses the walls and ceilings, filtering light and creating a visible banner of connectivity. Each work wing features unique abstracted graphics. Acoustically insulated nooks and softly-lit alcoves allow for heads-down work or private phone calls, along with “on-the-edge” spaces where employees can focus while adjacent to pockets of activity. The building features Microsoft’s first formal outdoor conference room; Wi-Fi enabled, covered, reservable, and heated for year-round use, it will serve as a model for future projects.